These are one of my favorite things of all time! I first became acquainted with Cottage Dill Rolls in culinary school, when we made them as part of our advanced baking and pastry class. I thought I had died and gone to heaven. In fact, I became friends with the instructor of that class, and as I progressed through the program, she'd usually find a way to come find me to share one on Cottage Dill Roll night - fortunately that was every 3 weeks. I later took the recipe to Deer Valley where I did my pastry externship and baked the dough in loaf pans for a lovely cottage dill bread. I don't make them often enough, but I've had "itchy fingers" lately (my friends know that to mean my fingers get all wiggly when I talk about my next creative culinary project because I can't stand the excitement, or to mean that I haven't had a culinary creative outlet lately and need to think of one.) and conference weekend seemed like a lovely time to get some baking in. Alas, I had actually tried to make a batch last Wednesday, only to discover that my yeast was dead, so today was my second attempt. This time I let the cottage cheese and the egg come to room temperature before starting so they wouldn't slow down the development of the yeast. And with new yeast they came out amazingly well. Soft, pillowy, rich rolls with a hint of onion and specks of fresh dill, topped with egg wash and kosher salt. My mouth is still watering.... I'm thinking Cottage Dill Rolls will have to be part of my upcoming Holiday Foods class curriculum. They're a great part of Thanksgiving dinner. This is exactly the recipe I was looking for. I have not had them since I was in school and 24 years later I still remember them being just about the best roll I ever had. From '85-'87 I attended and graduated from the Culinary Institute of America in Hyde Park, NY, and in Bakeshop with Chef Behrendt on March 24, 1987 I have my original hand written notes for Cottage Cheese Dill Rolls we made for the American Bounty restaurant. Although similar my recipe calls for the inclusion of fresh dill and horseradish. Lost all my notes from CIA, long story but everything was destroyed, but managed to contact one of the current pastry chefs and he gave me the original recipe, once I find it I will compare and post ingredients for comparing versions. 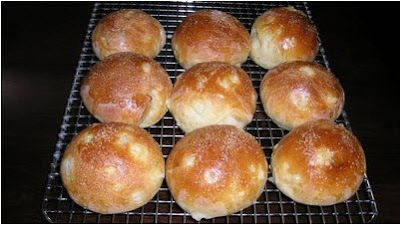 We literally stole rolls going out to the American Bounty and put them in our pockets for later; lol Chef always got P.O'd because we had to make another batch almost every day, everyone ate so many Still remains the best dinner roll recipe that exists. Thanks for the post.